The Triton is one of the newest sub ohm tanks on the market and the latest in this segment from Aspire. A lot of manufacturers are trying to get their piece of the sub ohm pie, some with all new designs and some with simply lower resistance versions of older designs. The Triton falls in the former category with several new design features that are worth checking out whether you’re looking to vape below an ohm or not. The Aspire Triton comes fully assembled in a relatively simple clear plastic box, packed snugly in a foam holder. Below that is a replacement coil head and a card with some warnings and tips on it. One of those warnings mentions turning the head to the proper setting to fill, but beyond that there are no instructions with the tank. More on that in a minute. The design of the Triton follows the popular bottom coil removable head design, but with some interesting features on the top half. A glass tube is surrounded by a nicely finished stainless steel enclosure. The 3.5 ml tank is made of Pyrex, so it is not only durable, but can be used safely with those e-liquids that react poorly with plastic tanks. Unfortunately, it appears that the glass is not removable from the tank. This presents an issue in that it is difficult to clean and dry the tank thoroughly. The top fill holes that we’ll discuss in a moment do make a quick flush fairly simple, but wiping the inside clean and dry is difficult. It also means that the glass is not replaceable. It is pretty well protected by the metal body, but if it does break, the the only solution is to replace the entire body. There are some good looking replacements available, however. 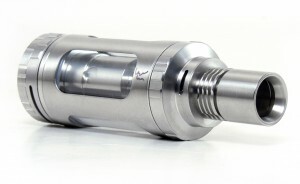 The base of the Triton has a standard 510 fitting with a slightly protruding center pin that should make a good connection with most devices. A ring around the base controls the airflow and it turns smoothly from fully closed to fully open with no stops. There is just enough resistance to make inadvertent adjustments unlikely. Unscrewing the base from the body gives access to the changeable coil head. 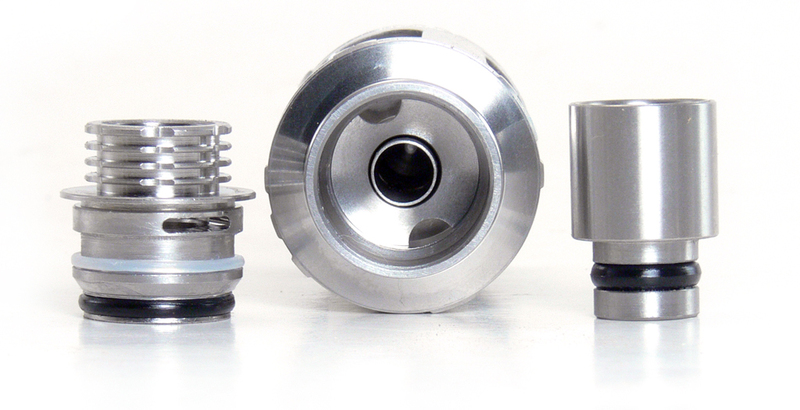 The heads themselves appear to be well designed for maximum airflow and sufficient wicking. A single vertical center coil is surrounded by cotton wicking material. There are four large holes in the body of the head that provide access for juice flow and large holes in the base for plenty of airflow. The kit includes both .4 and 1.8 ohm coil heads so that the tank can be used for either sub ohm or regular resistance vaping. I actually found that the 1.8 ohm head registered close to 2.0 ohms. I am glad to see a manufacturer acknowledge that sub ohm vaping may not be for everyone and offer the option of either with a great tank design. 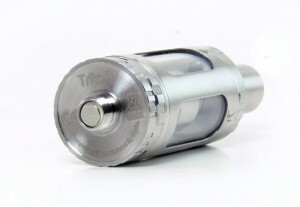 The top of the tank is where the Triton deviates from the norm. 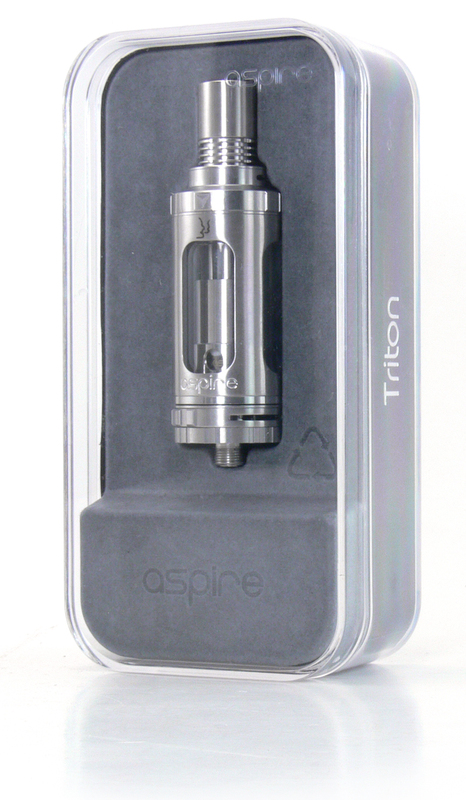 Most tanks of this style require the bottom to be removed for filling, but the Triton can be filled from the top. 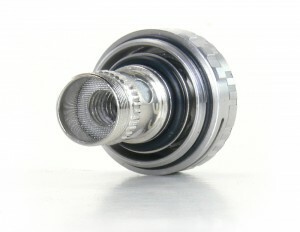 The top cap consists of three pieces, a rotating outer cap, a removable inner cap and the mouthpiece or drip tip. The mouthpiece has a wide bore in keeping with the idea of maximum airflow. Other 510 drip tips will fit as well, although I found that many of mine were a little loose. 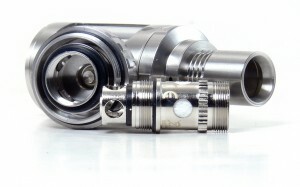 To fill the Triton, the outer cap is rotated to the fill position which seals off the wick holes on the coil head while opening two fill ports under the inner cap. 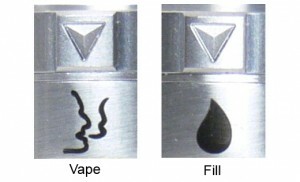 The inner cap is then removed by pulling up on the fins under the drip tip to reveal a deep well with the fill ports on the bottom of it. When finished, turn the ring back to the vape position and replace the center piece. It’s an ingenious design that makes filling a lot simpler with no need to remove the tank from the device. Given that this is an unusual approach to filling, you would think that plenty of attention would be paid to it in the manual or instruction sheet. Strangely, there are no instructions at all, only a warning sheet that, among other things advises not to leave the ring in the fill position. If not for that and the fact that I knew that top filling was a main feature of this device, I might have missed it completely. That finned section that we just mentioned serves to transfer heat and it is also used for another interesting feature of this device. Turning the center finned section opens and closes an air intake on the side of the top cap. Opening it adjustment allows more fresh air to be drawn in along with the vapor to create a cooler hit. Cooling off the vapor is useful when trying to make the biggest clouds results in vapor that’s a little too hot to inhale. 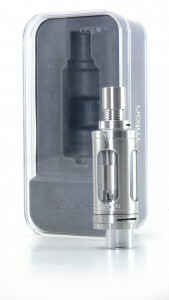 All of this design comes together in the Aspire Triton to create a device that has a lot of tweaking available but functions quite well right out of the box. I dripped a little juice on the wick to be on the safe side, but other than that just filled it and vaped it and it worked quite well. Due to the low resistance, the Triton works best with plenty of power, an airy draw and a direct inhale. The result is a very respectable cloud of vapor without much trying. Tinkering with the air flow at the base and the mouthpiece allow for even higher wattages and bigger clouds. The best vapes start to happen at about 25 watts. The design of the coil heads allows for plenty of juice flow even with high VG percentages. I did notice a little bit of drying after repeated hits, but not to the point of an absolute dry hit. Even with those repeated hits, it produces excellent amounts of vapor and can be run up to higher wattages. I’ve been vaping it around 40 watts with consistent results and great rich flavor. Although the juice flows well, I have not noticed any leakage, even with thinner high PG liquids. Some users have reported leakage due to ill fitting o-rings, but mine seem to fit together quite snugly. If clouds aren’t your thing, the Triton is equally at home with regular resistance vaping and a tighter draw. The 1.8ohm head functions quite well at around 10 watts and the airflow can be restricted to allow for a comfortable mouth to lung inhale. In either configuration, the Triton creates lots of vapor and excellent flavor. The top fill ports are really a nice feature. At work, for instance, it’s nice to be able to fill the tank without taking things apart. Filling just doesn’t get much easier than it does with this design. 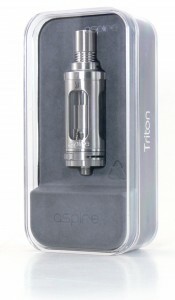 The Aspire Triton is a very good sub ohm tank that has a few features that may recommend it over some competitors such as the Subtank Mini from Kanger. The top filling and airflow options broaden its attraction, as does the inclusion of the regular resistance coil head. 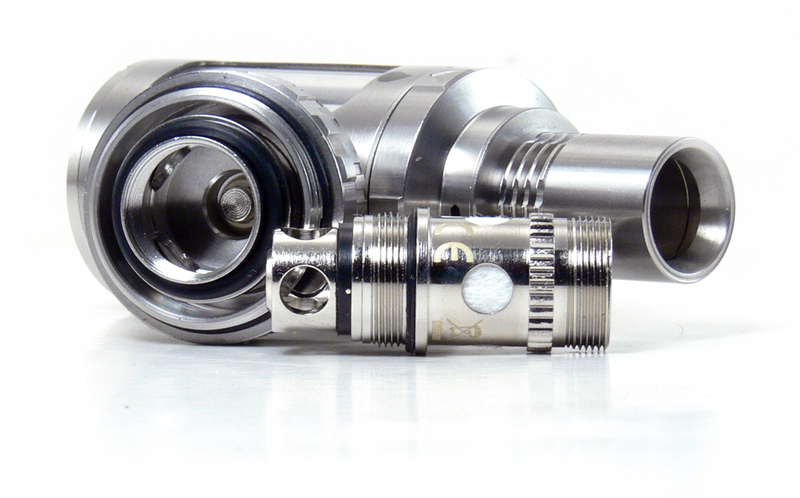 The Subtank Mini does come with a rebuildable head, however, something that must be purchased separately for the Triton. The Triton I tested was provided by Smoktek for this review and is available there for $43.95. That’s a fairly decent value – a little high compared to regular tanks, but in the same range as other sub ohm tanks. I’d love to see the rebuildable deck included in the kit, but the easily replaceable heads are what this type of topper is all about. The Triton allows nearly anyone to experience sub ohm vaping with very little effort, yet can be switched easily to regular resistance vaping. 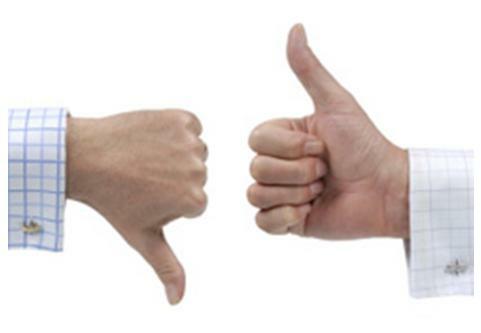 That makes it a good choice for someone new to sub ohm vaping or to vaping altogether. The Triton is robust enough to make it a good choice for an experienced vaper, yet simple and ready to vape enough to be a good beginner choice.